So the Olympics are almost over! I swore to myself I wouldn't get sucked into watching it. However I ended up supporting team GB every step of the way. From the amazing opening ceremony to our first gold medal to Jessica Ennis and Mo Farah. 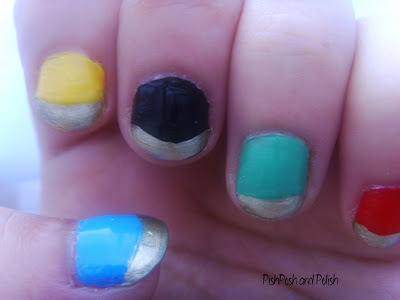 Not to mention all the Olympic manicure's the athletes were wearing! I stayed simple using the colours of the five Olympic rings and then freehanded gold tips. I wanted to do something that was easily recognisable. I used Barry M Cyan Blue, Yellow , W7 Black, Barry M Spring Green and Bright Red. The tips are Barry M Gold Foil. Everyone knew straight away what this is, so I call that a success! Did you enjoy the Olympics? 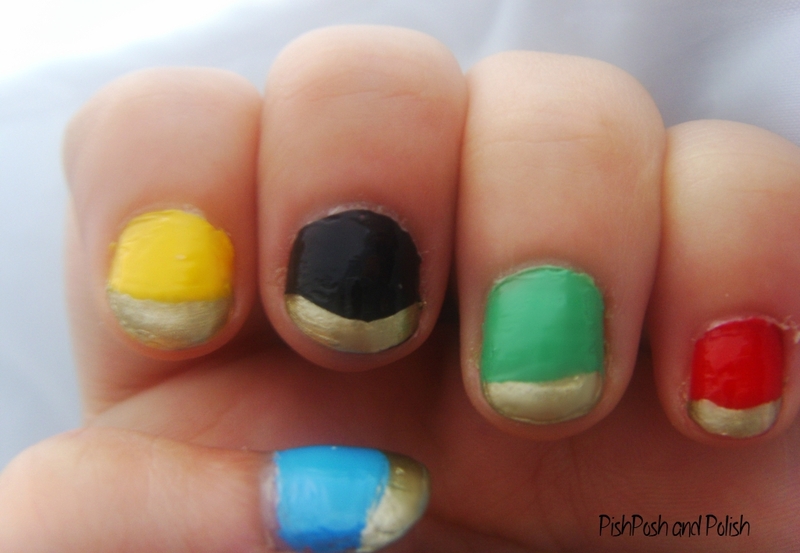 Did the Olympic spirit get to your nails?